Reviewed by PS3Fitness.com on October 30, 2010 . Summary: A decent workout title that introduces some innovations such as use of the Playstation Eye to let you see yourself working out on screen and more accurate motion controls with the Playstation Move. 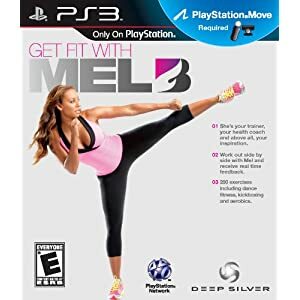 Get Fit With Mel B is the first “pure fitness game” to come out for the Playstation Move. If the screens for Get Fit with Mel B look familiar, there’s a good reason. The game was developed by a company called Lightning Fish, which also happened to develop a game for the Wii called “New U Fitness” in the UK, where it was pretty well received. In what turned out to be a disastrous move, the game was re-released in the United States by Ubisoft. In their wisdom, they decided to rename the game “My Fitness Coach 2”. The game had nothing to do with the original “My Fitness Coach” (a groundbreaking game developed by Respondesign), but evidently the Ubisoft marketing folks wanted to cash in on the brand name. The results were almost as bad as “New Coke” vs “Old Coke”. People who loved the first My Fitness Coach were up in arms that the “sequel” was nothing like the original. Reviews on Amazon were abysmal. Marketing department snafu notwithstanding, New U Fitness was not as bad as the reviews would indicate. It had a snazzy, three-dimensional opening menu, and you could choose on-screen instructors to lead you through a variety of basic calisthenics exercises (sit-ups, lunges, etc.). You could choose either individual exercises or have the system prepare a daily workout that combined different exercises over time based on your fitness goals. It had the typical bells and whistles of a Wii workout game such as allowing you to change your background scenery. It suffered from the two things that most Wii games suffer from: lower resolution graphics, and spotty motion controls. But if you were committed to to working out, it was a decent title which was more or less an exercise DVD which let you “mix and match” exercises, nothing more and nothing less. Sort of like eating your vegetables, it wasn’t “fun”, but it did the job. My initial impression of Get Fit with Mel B is pretty much the same. The premise of the game is more or less identical to My Fitness Coach 2 and in fact, so are the menu options. Today’s Workout: When you set up your profile, you can identify up to two fitness goals falling under the categories of General Health (weight loss, detox, lower cholesterol), Lifestyle (e.g. “Destress”), Special Occasions (e.g., new mom/dad, getting ready for the holidays), Sports and Activity training, and working on specific parts of your body. The system will automatically put together a daily 30-minute regimen of exercises that will target these goals. Choose Workout: Here, you can drill down to the specific exercises that you want. Exercises are broken into two categories: Fitness and Aerobics. Fitness exercises include things like crunches, squats, lunges, etc. You typically do them in reps of 10-20 before going onto the next exercise. Aerobics is where this title is at its best. You can choose from a series of dance moves, boxing moves, or cardio moves. There’s also a “custom workout” option which lets you put together your own string of exercises (selecting exercises and defining the number of reps for each), a “practice” option which lets you practice certain exercises as many times as you like (anywhere from 4 to 96 reps), and a neat “challenges” option where you’re pushed to complete a series of themed exercises (dance exercises, abs exercises, leg exercises, boxing exercises, and cardio exercises) within a certain amount of time. Your Progress: This section allows you to track your workout progress. One thing the Wii has that the PS3 doesn’t is a balance board which will automatically chart your weight. So it’s time to dust off that bathroom scale. Nutrition: I never quite understood the concept of having recipes on a video game. I get that they want to provide a “holistic workout regimen” that involves proper diet, but on the other hand, not many people have their TVs set up in their kitchen or a printer hooked up to their video game console. Here’s a video of me doing the “cardio” exercises under the “Challenge” section. I look gargantuan compared to Mel B because of two things. First, the furthest I could get my Playstation Move camera was about 5 feet away. Secondly, because I’m a little bashful–the last thing I need is to be recognized on the street and told how bad my form was on the video! After seeing myself on TV, I wonder if I could have been the sixth Spice Girl: “Freakishly Huge Headless Spice”. The game makes excellent use of video. You first get a hint of this when you seeing a video image of yourself under “Your Progress” in the opening menu options. After you select your scenery and start your exericses you see two exercise mats, one with a video image of Mel B (it’s really her, not a creepy cartoon rendering), and the other with–you! As Mel B does the exercises, you can match her movements and timing exactly, step by step, arm movement by arm movement. It’s a vast improvement over the “do the mirror image of my movements” inherent in Wii exercise games. The scenery is breathtaking. Granted, when compared to other PS3 games it’s probably not that impressive, and it’s really just a backdrop (there’s no interaction with the scenery), but for someone used to choosing background scenery on a low-resolution Wii, I was impressed. The first scene I chose was the “City Apartment”, which was a window overlooking a city skyline. You can also choose from a park, a dock (in the Maldives, no less), a poolside, a forest meadow, and a luxury yacht. The array of individual exercises is impressive. There are 22 basic fitness exercises, but 15 dance exercises, 20 boxing exercises, 14 cardio exercises, and 14 advanced cardio exercises. Put them together in different orders with different amounts of reps, and you’ll have a pretty good variety of workouts. You can choose to work out using your own equipment, including an aerobics step, a fitball, a resistance band, wrist weights, and ankle weights. I like little details they put in. When it’s time for a water break, Mel B takes out a bottle of water and drinks it with you. The game is intelligent enough to give different “fitness goals” based on your profile information (e.g. whether you’re male or female). And so on. While other games say that you need to be at least 8 feet from the camera, most of the time you can get away with being 5-6 feet away. Not so with this game. Anything less than 8 feet and your video image will not appear on the screen properly. For a lot of exercises, it simply doesn’t make sense to have the Move controller tracking your moves. For standing exercises like squats, lunges, and jumping jacks it’s great. But for exercises like push-ups and crunches it just doesn’t make sense. It doesn’t use the Playstation Move XMB navigation for menus. I’ll chalk this up to the developers not knowing about it, being an early release title. Still, it gets annoying having to point a cursor and click on every button when every other Move game lets you hold down the trigger button and move the controller to navigate. Worse, you can’t even use a Dualshock or Sixaxis controller to control menu options. This is an annoyance I don’t think the game developers could have done anything about, but when performing exercises that require you to be on the floor, it’s very tough on the neck to look up at the TV screen to follow the moves. Perhaps a little more vocal guidance from Mel B during these exercises would help. In general, while the motion controls were a step above what you could find on the Wii, I didn’t get the sense that they made full use of the Move’s capabilities (generally, as long as there was ANY motion, it registered on the screen). This has all the bearings of a game which is pretty well made for a first-generation title, but probably won’t stand the test of time as newer and more innovative games come out. Still, for someone looking for a “pure” exercise game, this is not a bad choice. It provides an impressive amount of different cardio fitness and aerobics exercises. The ability to see your own actual video image next to Mel B is not just cool–there’s no better way to help you visualize and time the exercise. And the scenery is definitely beautiful and head-and-shoulders improved over what you’d see on a Wii. That, plus the fact that this is the first attempt at a fitness game for the PS3, gets it a solid 4 stars from me. Having said that, I hope as game developers produce more fitness titles for the PS3, that they can introduce more “gaming” elements to make workouts a lot more immersive and fun. Has anyone tried both the WII fit and ps3’s Get Fit with Mel B? Not sure which one is better. This is FAB, FAB, FAB. I really enjoy doing the exercies. I’m on my second week and am already feeling lighter and less guilty (about not exercising.) I’d recommend this to everybody. Cons: While doing push ups it was inconvenient for me to keep holding the Move motion controller.